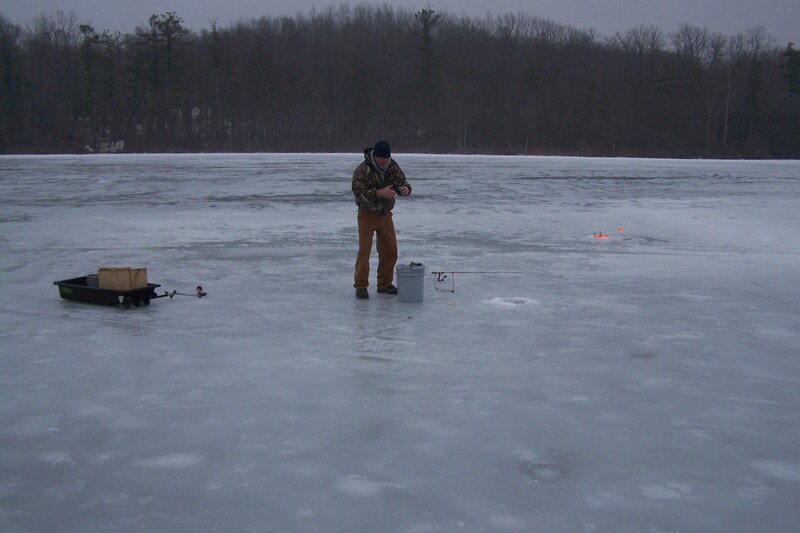 Feral made a pitch to ice fish on Hess Lake last Sunday and I blame myself. 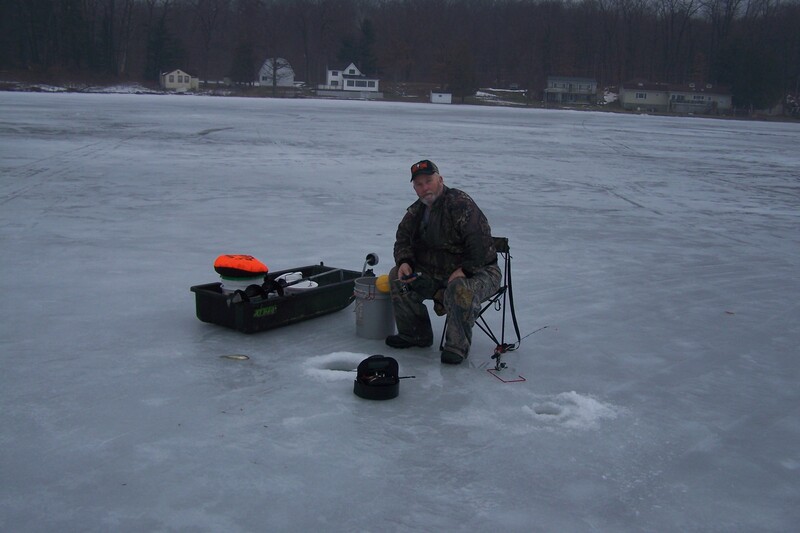 If I hadn’t foolishly mentioned ice fishing in the previous post I could have done something more constructive like planting corn early. The mere mention of Hess Lake brought back memories from 20 years ago and slaying crappies – one after another. Can a lake change in twenty years? Feral set the meeting time for 8:00 AM and I had to imagine his other fishing buddy, Chuck, a lake expert, shaking his head. Crappies, if I remember right, bite at night, in the dark. On the other hand, if we could find them, and drop minnows into their midst, it could be workable. My job was to pick up some pike minnows for tip-ups, Chuck and Feral would get wax worms and crappie minnows. I found a bait shop open in downtown Newago at 7:30, bought half a dozen pike minnows and mentioned Hess Lake to the store owner. Reading his expression was difficult, but not impossible. He had just sold me six pike minnows and now he didn’t want to be discouraging. I mentioned crappies and pike. He struggled to think of something good to say. I said I fished Hess lake a long time ago. He said Hess was a great crappie lake twenty years ago. I knew he wasn’t lying. Feral, Chuck and I had all found the same internet post about where to fish. Four hundred yards out from the boat landing, veer right. As it happens, two other ice fishermen headed out on the ice minutes ahead of us and it appeared they read the same post. Hess Lake is 755 acres, huge, so if these guys turned around, it probably seemed like we were following them. We ended up on the same acre, OK, 1/4 acre, but they were cool about it, even talkative, which is always a good thing. If you can imagine 755 acres of ice and a total of five guys fishing on a Sunday morning you may understand a reality that slowly dawned on the five guys. 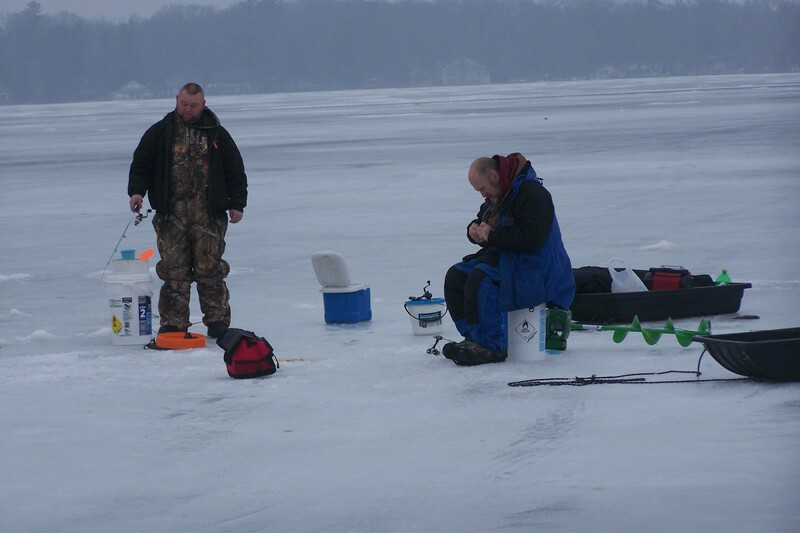 It actually started well, one of the other guys pulled out a crappie right away, within seconds of dropping a line. Great, right? Feral and I set out a few tip-ups for pike (one fish equals a whole meal!) 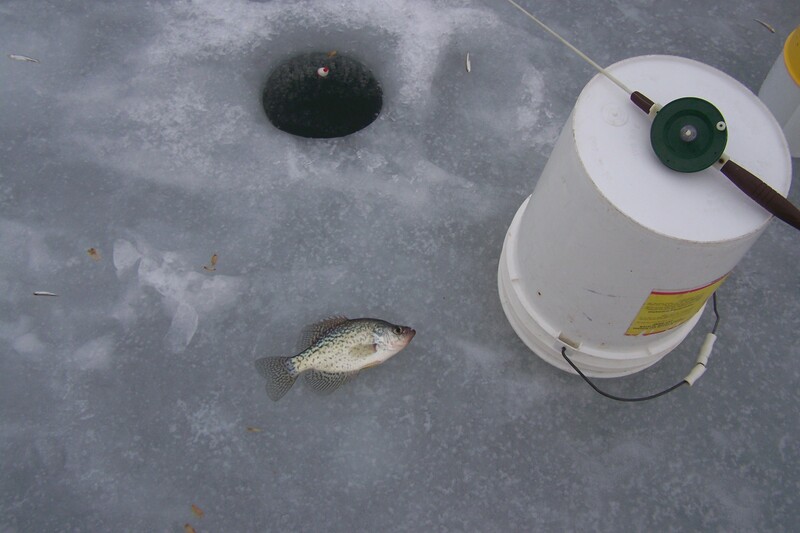 and then started working on finding crappies, bouncing from hole to hole. I caught one decent crappie, 9 inches, and Chuck caught another. Not much shouting from the other guys but they were toughing it out. Tiny perch were biting, trending smaller as the hours went by, whereby the smallest perch might have brought some honor if we would have pre-thought having a smallest fish contest. About four hours in I started thinking about what I might put in a fichigan post. One idea was getting a ticket for loitering on Hess Lake. That had possibilities, DNR watching us with binoculars and wondering what we were doing out there. And not really wanting to walk the 400 yards to see if there was evidence of fishing (an actual fish). When we finally decided to call it the other guys stopped over to chat and commiserate. I mentioned fichigan, posting a photo of them, and then blaming them for the fishing. That got a laugh. I give them a lot of credit: as we were leaving they set up some ice tents. Fours hours of tough fishing and they were just getting started. 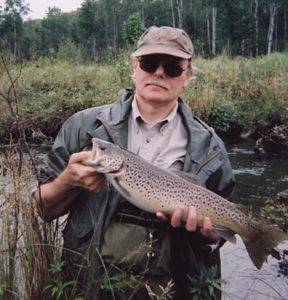 Sometimes the fishing does a one-eighty so it is possible they did OK. Really.